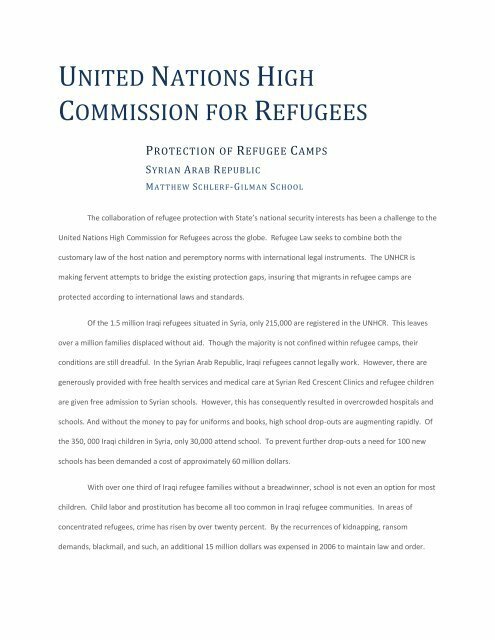 UNITED NATIONS HIGH COMMISSION FOR REFUGEES PROTECTION OF REFUGEE CAMPS SYRIAN ARAB REPUBLIC MATTHEW SC HLERF-GILMAN SCHOOL The collaboration of refugee protection with State’s national security interests has been a challenge to the United Nations High Commission for Refugees across the globe. Refugee Law seeks to combine both the customary law of the host nation and peremptory norms with international legal instruments. The UNHCR is making fervent attempts to bridge the existing protection gaps, insuring that migrants in refugee camps are protected according to international laws and standards. Of the 1.5 million Iraqi refugees situated in Syria, only 215,000 are registered in the UNHCR. This leaves over a million families displaced without aid. Though the majority is not confined within refugee camps, their conditions are still dreadful.  In the Syrian Arab Republic, Iraqi refugees cannot legally work. However, there are generously provided with free health services and medical care at Syrian Red Crescent Clinics and refugee children are given free admission to Syrian schools. However, this has consequently resulted in overcrowded hospitals and schools. And without the money to pay for uniforms and books, high school drop-outs are augmenting rapidly. Of the 350, 000 Iraqi children in Syria, only 30,000 attend school. To prevent further drop-outs a need for 100 new schools has been demanded a cost of approximately 60 million dollars. With over one third of Iraqi refugee families without a breadwinner, school is not even an option for most children. Child labor and prostitution has become all too common in Iraqi refugee communities. In areas of concentrated refugees, crime has risen by over twenty percent. By the recurrences of kidnapping, ransom demands, blackmail, and such, an additional 15 million dollars was expensed in 2006 to maintain law and order.